Lying on the southern tip of Sumatra, Lampung is visually stunning, culturally interesting and historically humbling. It is home to some of the most amazing and, unfortunately, very rare creatures. Lampung is an underrated beauty. It is where adventures are always unforgettable and unfailingly eye opening. The how-shaped island of Sumatra shares its western, northwest and southwest coastline with warm water of the Indian Ocean. Curving on its spine is a line of feisty volcanoes that creates a land contour that is ever so magnificent. Lampung, with its location on the south tip of the 6th largest island in the world acts as the gateway to the island of Java, the most populated island in Indonesia. If you want to see elephants playing football, come to The Way Kambas National Park, which is located on the southeat coast of Sumatra and can be reached in 2.5 hours from Bandar Lampung by car. When road conditions are not mint then it might take an hour longer. On our way to the park I was served with views of plantations, mostly rubber and black pepper. The latter is Lampung’s prized product and imported all over the world along with their coffee beans. Though the forests inside of secondary growth as a result of extensive logging in the past, it is still a great representative of a mixed ecosystem that consists of swamp forest, lowland rainforest, mangrove forest, dry beach forest and expanses of grassland. Way Kambas National Park strives to create a safe environment for the critically endangered Sumatran tigers, elephants, and rhinoceroses, also Malayan tapirs, monkeys, leopard, and more than 400 sprecies of birds, including the endemic white-winged wood duck. Way Kanan is the perfect area to bird -watch. The sub-district also offers fascinating jungle treks. Sepakbola or football matches are usually held on weekends to attract more visitors. 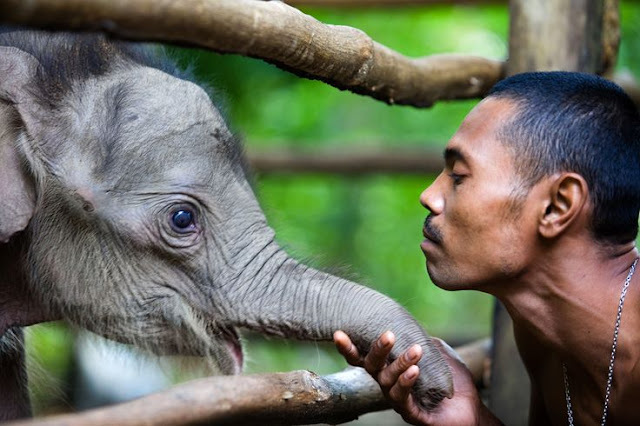 The park and the Elephant Convervation Center are strenuously doing everything they can do provide a safe and comfortable environment fot the remaining Sumatran Elephants. Stories of conflict between the giants and humans that live around the area are quite common and they almost always end sadly. The elephants Training Center was initially built to rehabilitate wild elephants that were wrecking farmers’ crops and trained them to actually assist humans in farming. It did not really work out well. The training of the elephants has given them skills to attract more visitors and spark interest in conversation. Besides the Elephants Conservation Center, the park also houses of Sumatran Rhino Sanctuary, a breeding center established in 1995. Encountering Sumtran Rhinoceros in the wild is, of course, another story. The beautiful creature is as mythical as fairies because of their solitary tendencies. This scares the conservationists because there is a possibility that the animal could go totally extinct and humans that care do not even have a chance to prevent it. The sanctuary is an attempt to prevent that from happening. The work is hard, but not impossible.